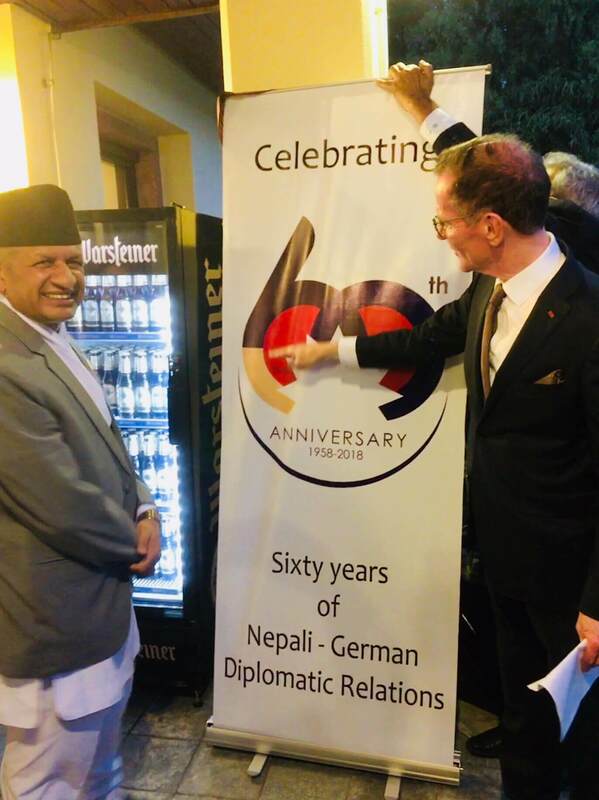 Sixty years ago Nepal established diplomatic relations with Germany when both countries were emerging from dark and difficult times, and both were trying to establish a new identity. They wanted to open up to the world and define a new place for themselves within it. Look at Nepal today: it has overcome decades of profiteering by a rent seeking elite, it has overcome a decade of civil strife, it has given itself a new, democratic, republican and federal constitution, and the Nepali people have validated all this by voting massively last year, installing the most powerful government in Nepal’s modern history. This government, carried by a united party, knows it has to fulfill the promises which got it elected. It has the power and the wisdom to reconcile the country with its past and help it look boldly to the future. Building the future on the foundation of a well understood past shared by all will be a process. It cannot be achieved by the stroke of a pen or the handing out of some money from state coffers. But if this process gets to a credible start now in the coming two to five years, it will be empowering Nepali women and men like never before in history. From many conversations in the last nine months here, I am confident to say: It seems to feel good to be a Nepali today. And I can tell you myself: it feels good to be a German today. We have been holding joint consultations on the next two years cycle of development cooperation between Germany and Nepal. Germany will continue to engage in the health and energy sectors, and will continue to work on enabling Nepali small and medium sized enterprises for a competitive world market. Our cooperation builds on decades of common work. Bhaktapur may have the longest story to tell about successes in our cooperation, about trust built, even after initial failures were overcome. This learning process never ends. I am happy to further engage with this proud, able city and its citizens on a cooperation that makes best use of what Bhaktapur can give to the nation and of what a modern Germany can contribute to this long standing partnership. Not all is government to government cooperation. We want to make Nepal a place for German and European industry to invest in. Employment will be created durably and reliably in this competitive world through private sector engagement. I thank Nepal for extending support to Germany in the upcoming election to non-permanent membership of the United Nations. We count on the support, so that we can work for multilateral peace-making, something to which Nepal’s army is contributing so much. And look at Germany today. The country is reunited, its 80 million people are part of a European Union of 500 million citizens who freely trade, travel, work and transfer assets among themselves. The European Union ensures the rule of law for all and organizes the outside protection of the Union territory. Germany has established its own particular brand of foreign and security policy – not so much by talking, but by how we behaved. We have taken on responsibility such as intervening militarily against dictatorship and ethnic cleansing in the Balkans, offering the parties to the conflict the option to become members of the European Union. But we refused to participate in the invasion of Iraq at the beginning of the century. The most important point for us today: the European Union as a whole is establishing its own Foreign and Security policy of which Germany is fully a part. Excerpt of a speech by Roland Schäfer, Ambassador of Germany to Nepal, on 20 May to mark the 60th anniversary of Nepal-Germany diplomatic relations.